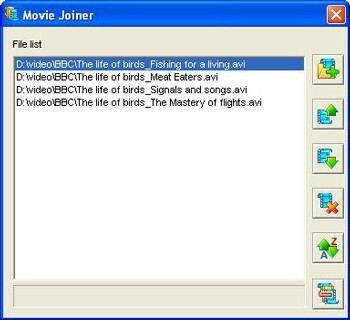 Movie Joiner is a simple tool, which helps you to join several media (video, sound) files into large one. Files must be the same format. Movie Joiner works with DivX,AVI, MPEG (*.MPG, *.MPEG, *.M1V, *.M2V, *.MP3), Windows Media (*.WMV, *.ASF, *.ASX, *.WMA), Real Media (*.RM) and QuickTime (*.QT, *.MOV) media files.You can add and remove files from the file list, and put it to rights. Program help includes step by step instructions on how to join files.